Kefir is a fermented drink made from a kefir grain of symbiotic microorganisms wrapped up in a matrix of proteins, lipids and sugars. It has been used for centuries for a wide variety of conditions. In this article, you will discover the top 7 proven health benefits of kefir. Kefir grains are white clumps that contain a wide variety of bacteria and yeast. This fermented drink is one of the best drinks for improving digestion and natural immunity. It is believed to have been first developed in the Caucasus Mountains of western Russia. The shepherds there used to carry milk in leather pouches. Sometimes the milk would sit for several days and ferment. The fermentation gave it an effervescent taste that was cool and refreshing. These cultures later found that kefir made a great natural medicine that was used to help digestive disorders, low energy, and compromised immune function (1). 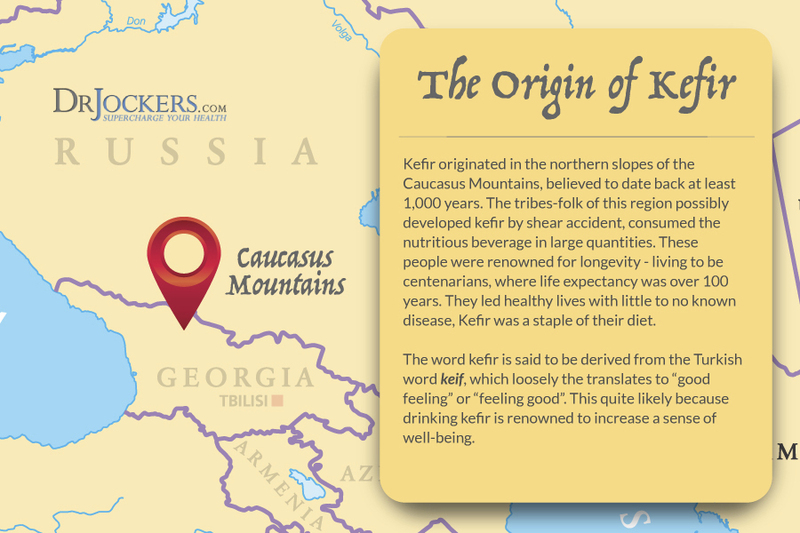 The Abkhazian people in the Western Russia – Caucasus mountains who developed and continue to utilize kefir are one of the longest lived cultures. They have a high percentage of centarians. In John Robbins book, Healthy at 100, he discusses Dr Alexander Leaf’s research on the Abkhazian people (2). Kefir grains contain a polysaccharide known as “kefiran.” Kefiran is a water soluble and appears in a white/yellow form that typically resembles rice. It is fermented at room temperature for 12-48 hours. Raw cow, sheep, or goat milk are great mediums for kefir fermentation. Ideally, these animals should have been grass-fed. Milk from grain-fed mammals is highly inflammatory due to abnormal essential fatty acid ratios (3). The milk should never be pasteurized or homogenized as these processes damage the integrity of the amino acids and critical enzymes in the milk (4). Another popular and easy to use kefir option is coconut water. Coconut water is extremely rich in potassium and trace minerals. It also contains anti-oxidants and cytokinins. Cytokinins regulate cell division and influence the rate at which plants age. These compounds also have an anti-aging effect on human cells and tissues. Coconut water kefir is a delicious way to enhance hydration and recolonize your gut and mucous membranes with healthy strains of microflora. Coconut milk can also be fermented although it needs a little bit of coconut water to provide natural sugars for the fermentable microorganisms to feed off of. There are a lot of comparisons between yogurt and kefir. Kefir, however, is considered the probiotic powerhouse for several reasons. Yogurt provides several strains of beneficial bacteria that benefit the gut. Kefir has a much wider variety of beneficial bacteria that have a more potent effect on the GI System and mucous membranes of the body (4, 5). Kefir contains several important strains of friendly bacteria not commonly found in yogurt. These bacteria include Lactobacillus Caucasus, Leuconostoc, Acetobacter species, and Streptococcus species (6, 7). Kefir also contains beneficial yeasts, such as Saccharomyces kefir and Torula kefir. These yeasts are known to hunt out and destroy pathogenic yeasts in the body. These beneficial yeasts are considered the best defense against dangerous yeast organisms like Candida Albicans. They form a virtual SWAT team that cleans, purifies, and strengthens the intestinal walls. These microorganisms help the body become more efficient in resisting dangerous pathogens such as E Coli, Salmonella, Staph Aureus and intestinal parasites (8). Poor bacterial balance can cause blood sugar imbalances, sugar cravings, weight gain, poor immunity, low energy and digestive disturbances amonth other things. 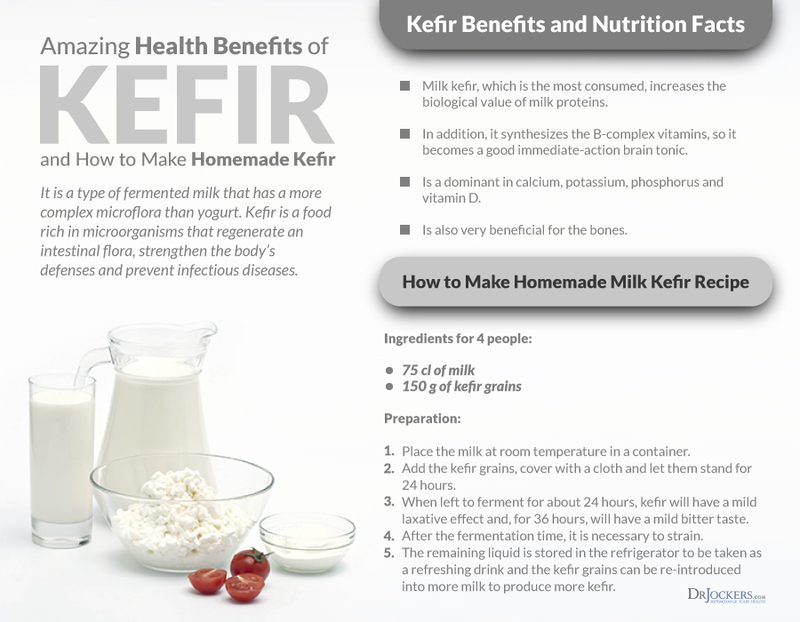 Kefir addresses all of these problems by restoring balance to the microflora of the body. The active yeast and bacteria help assimilate nutrients in the gut and enhance the usage of certain trace minerals & B vitamins (9, 10). Its excellent nutritional content offers healing and health-maintenance benefits to people in every type of condition. The regular use of this drink can help relieve all intestinal disorders, promote bowel movements, reduce flatulence and create a healthier digestive system (11, 12). Fermented products like this help to cleanse the body and balances the inner ecosystem for maximal health and longevity. 1. Scientific research on Kefir Extract taken from: Farnworth, E. R. (2006) Kefir – A Complex Probiotic. Food Science and Technology Bulletin: Functional Foods, Volume 2, Issue 1. 3. Daley CA, Abbott A, Doyle PS, Nader GA, Larson S. A review of fatty acid profiles and antioxidant content in grass-fed and grain-fed beef. Nutrition Journal. 2010;9:10. As much as I like the Maple Hill kefir, it is expensive. I have been making my own using local grass-fed whole raw milk….good stuff! I can confirm that on multiple occasions over the years when I’ve had the dreaded food poisoning from improper food handling, etc. which results in diarrhea & stomach cramps that it’s kefir to the rescue! It literally works within a matter of hours, in my experience 2 ~5 and I’m feeling much better, thus what might take days to recover from is reduced to about half a day. Amazing drink, although it took me a while to get used to drinking it. Thanks so much for sharing this Eric!! I’ve struggled with digestive health since I was an infant. I have seen multiple doctors over the years for problems related to severe constipation, diarrhea, & heartburn. I had my first colonoscopy at 14 years old and have been on and off high fiber diets, and fiber supplements for decades. It had been years since i’d had normal stools; with this came: constant bloating, gas, indigestion, heartburn, constipation and inflammation. I would go 4-5 days without having a bowel movement. I met a personal trainer who suggested I start consuming organic kefir. For the sake of wanting any kind of relief…I went to sprouts and loaded up on Kefir. I began drinking 4-8 oz daily. I added raspberries for extra fiber and dark cacao chocolate chips to give it a little sweetness. To my surprise I now go to the bathroom daily now compared to once or twice a week, my heartburn has stopped entirely, I rarely experience bloating and the inflammation I used to experience in my abdominal region and in my hands has decreased significantly. I’m not saying this is a miracle cure by not means…but for someone whose only 30 years old and has suffered from digestion problems my whole life… Kefir has allowed me to eliminate medical grade drugs, and man made supplements. It’s nice to have found a product that comes from natural sources. I’d highly recommend this for anyone who struggles with digestion issues, heartburn, inflammation.